The Saga of the Runner Bean Rogues Continues! The Bath WI Edible Garden is a busy place at this time of year, this is the time when we are planting and preparing, planning, and enjoying seeing the flowers, herbs and vegetables doing so well. The nasturtiums have popped their heads above the soil, as have the potatoes and lots of other lovelies. Our wigwams have waited for their runner beans to scramble up them, as they did last year, and so again, lots were planted at the base. But what has happened! This time most of them have been chewed through at the base and now lie upon the ground like fallen leaves ! No matter, there were replacements, and in they went . . . . . . only to meet the same fate. Time for action! 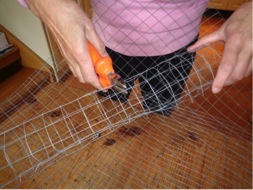 Sheets of strong wire netting cut into strips with wire cutters, and then rolled into tubes secured by thin wire strands have been made and planted out with the third and hopefully last planting of runners. Those unwanted visitors have surely now been foiled?! And our beans can begin their journey skywards. Good luck little beans !